This is the start of the second day I've had to work on my contribution to the installation piece for Port Stanley. The finished sail will be one of nine mounted on a frame in The park near the bridge in Port. At lest that's the plan as I've heard it, village council could place it elsewhere. 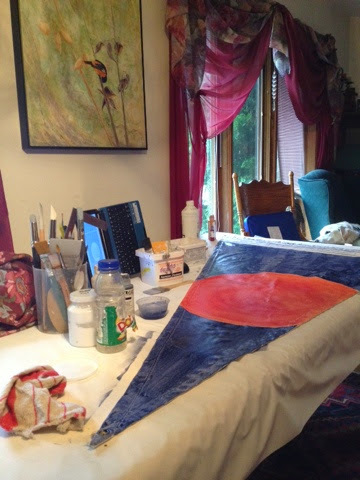 Because of the size, 63x38x74, I'm working on the dining room table, don't worry, it's an art veteran!